Photo courtesy Regional History Department, the Community Library This photo of the Russian John outpost north of Ketchum is part of the Breckenridge photo collection being put online by the Community Library in Ketchum. If journalism is the first rough draft of history, then oral histories come in a close second. Listening to the thoughts and recollections of someone who lived through history can be eternally fascinating or interminably boring, but unquestionably useful. More than 30 years ago, a young woman named Miriam Breckenridge walked into the Community Library in Ketchum and handed over a box of cassettes. On each one were recorded interviews she had done with 18 sheep ranchers of the Wood River Valley. They include Bud Purdy, Joe Burgy, Elizabeth Thomas Brooks Peavey, Alta Horton Ellis, Rink Williams and Pete Lane, Miriam had collected the memories of every family in the valley with roots in the industry that once dominated the area. And so the regional history department was born. Miriam, who was born in the late 1930s, met and married a would-be-pharmacist named John Breckenridge while she was in college in Utah. Much to her surprise, however, after they graduated, she didn't settle into a comfortable life as the wife of a pharmacist, perhaps in her home state of Massachusetts. Instead, he convinced her to move to Idaho to join the family sheep ranching business. 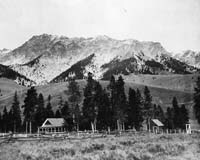 The Breckenridge family farm was located along Pole Line Road in Twin Falls and, come summer, they would drive the flocks north through the Wood River Valley to the Busterback Ranch in the Sawtooth Valley. In the 1970s, after half a lifetime as a sheep rancher, it occurred to Miriam that there was really no body of information about the sheep business. "I probably would have been just like anybody else, if I hadn't been in the sheep business, wouldn't have thought anything about," she said in an oral history recorded in 1978. Triggered by the number of people over the years who wanted to see her sheep wagon or take a photo of the sheep, she thought there just might be some interest in preserving the history of the industry. "Everybody says, 'Are you writing a book, Miriam?'" she continued. "I have no idea whether I'm writing a book, because I don't know whether even I could ... get down on paper the feel that the sheep men have for their animals, their lifestyle. Whether I could get down on paper the loneliness of this work, the loneliness of the wives' living." She didn't write a book. Instead, she started what is arguably one of the crown jewels of the Community Library, the regional history department. "Miriam provided the seed collection for the department," said department Librarian Sandra Hofferber. "Her donation gave the impetus for its creation in 1982—she was the department's godmother." And today her daughters are continuing their mother's gift, providing funding to have all the oral histories she created put online. "Human resources have always been a limiting factor with oral histories," Hofferber said. "Most collections stop once the interviews are recorded, but they aren't used unless they're transcribed and made accessible in other ways. It can take up to 24 hours of work just to get an hour of interview transcribed." The value of oral histories is immense. Just in these 18 stories on a seemingly one-note topic there is a rich treasure trove of information to be gleaned about life in the Wood River Valley from the mid teens through the 1970s. "When the Lodge opened in 1936, my mother and aunt came up from Hagerman to take a look at the Sun Valley Lodge and have lunch or something, and I thought to myself, this is the most horrible-looking thing—a dingy brown cement building stuck out in a hayfield surrounded by sagebrush—what in the world do they intend to do with it?" Pete Lane, son of Jack Lane, who owned the Lane Mercantile building on Ketchum's Main Street (until recently occupied by Starbucks), talks about how around 1916 his father was trying to decide where to locate his new business. He was choosing between two towns of comparable size, Ketchum and Hill City. Lucile Friedman, whose father was (arguably) the first man to bring sheep into the Wood River Valley and whose family donated its land to the current airport, dishes on Hailey's Red Light district, located in what is now the China Gardens subdivision. It has long been an ambition of Hofferber's to get all of this information online, making it more accessible to people. Ultimately, she wants to have every one of more than 500 oral histories stored at the library on the web, along with transcripts and indexes. "We have a great collection," she said. "Everything from a turn-of-the-century housewife talking about food preservation techniques to Patrick Hemingway talking about what a great dad he has, to Averell Harriman in between." To tackle this project, Hofferber had been looking for student interns with the technical chops to complete the task. "But the funding out there is limited for tax-based libraries and museums, so I couldn't apply," she said. Enter Miriam's daughters, Mims Harris and Carolyn Gregg, who donated the necessary funding to hire Ben Hofferber, Sandra's son and a university sophomore majoring in computer science and virtual technology and design, to work on the 18 histories that their mother recorded. Ben started the 300-hour project three weeks ago and has already uploaded six multimedia presentations on a service called www.VoiceThread.com. "The New York Public Library uses VoiceThread, so that was what we were modeling ourselves on," he said. Currently, he is focusing on creating interactive content including sections from the histories that are of specific significance or entertaining anecdotes, along with slide shows of images from Miriam's collection of more than 200 historical photos. The ultimate goal is to have the complete audio online, but for now, these bite-sized snippets are very appealing for the lighthearted historian who just wants a taste of the times. People can also post comments via audio, video or text, so the hope is that others with memories from the time can add to and grow the historical record. Ben is posting his daily progress on the project at www.breckenridgeproject.blogspot.com and the collections he has already uploaded can be accessed by going to www.VoiceThread.com, clicking on browse and typing in "community library RHD." For the 19-year-old college student it has been an interesting experience grappling with the trials of today's technology and the scratchy voices talking to him from the past. But it has been one he enjoys. "These oral histories gave me an amazing look into the past and gave me a feel for the type of people who lived in the valley at this time," he said. "Miriam Breckenridge focused many of her histories around the sheep industry, an industry that has almost no place in the modern public eye. I found these histories insightful and I feel that their content should be given more light." Keep up with the Miriam Breckenridge Collection at www.breckenridgeproject.blogspot.com and listen to the recordings at www.VoiceThread.com. Click on Browse and type in "community library RHD."